Sometime in the last couple of days, the monthly active users (MAU) of Facebook’s mobile apps passed 300m. 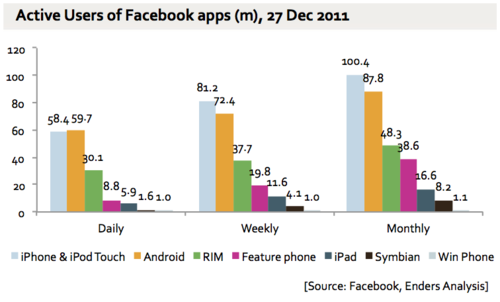 But the most important thing about this chart is the total - 300m mobile app users. This is more than either Apple or Android in total, each of which have around 225m active mobile users. Facebook doesn’t tell us how many only use Facebook on mobile, but the number is likely to be high. How does this compare to mobile web users? Facebook gave a number for total users of 800m and mobile users of 350m back at the end of September, at which point there were around 250m MAUs of the apps (i.e. 350m people used Facebook on mobile of which 250m used the apps and 100m used the mobile web). In other words 70% of mobile users and 30% of all users used apps to access Facebook. The Windows Phone data appears not to reflect the real usage of the platform - Nokia has now sold ‘over 2m’ Lumia phones, but the Facebook app data is well below this.